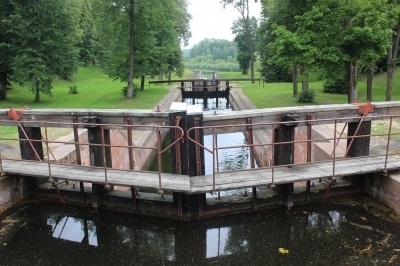 Augustow Canal is part of the Tentative list of Belarus in order to qualify for inclusion in the World Heritage List. I only visited the Augustow Canal on the Belarus side in April last year. The Polish side seems like a long drive and little tourist stuff in the northeast (sorry to say) of the country. Saying that, there are probably nice forests but nothing unique or special. Belarus on the other hand has the city of Grodno (still unsure why it's not HrodnA as that's how the pronounce it) nearby and easy access to the canal by a great road system. Only when you get close to the canal do the roads get gravel and unclear signs could possibly lead you onto the wrong road through the forest. Driving past the canal with NO barriers surely is not for the faint of heart, unless of course you are used to driving around in Dutch cities! I stopped at three places with the pictured Dambrowka clearly the highlight. The first thing I noticed is that the entrance is FREE - wow. Not even parking or someone trying to make a buck of tourists - although that could be different in summer time. The swan pedal boats were also not out because there was clearly nobody vacationing here at the time. Another bridge you can drive over the canal. Not that great but just want to point it out. There is a cycle track along the canal from Dambrowka all the way to the border which I would probably aim for on my next visit. The weather was beautiful. As for the uniqueness of the canal, it claims to be old - great - and it was used for a long time. I don't know if that is enough to persuade ICOMOS to inscribe it. The documentation surely lacks detailed information on the unique aspect of the canal at the moment. I still recommend to come here inscription or no inscription - it's a nice place! The Augustow Canal was constructed in early 19th century. It was designed for exporting grain and presumably timber to Baltic ports bypassing the territory of Eastern Prussia, which introduced excessively high taxes on goods shipped up the rivers Vistula and Nieman to the Baltic Sea ports. It was completed in 1839. Economically, the canal did not meet the expectations as railroad replaced its role as main mean of good transport. It was locally used until 1939 to float round timber within the region. It is now developed as a major tourist attraction in both Belarus and Poland. I visited the Belraussian part of the canal from Hrodna (Grodno). Renting a car made it easy, being about 30 minutes from Grodno center. Some of the roads are made of gravel, but still easy to drive. There are several buses getting to that area though. It was on a Saturday, so numerous day visitors were around, either hiking, cycling or canoeing. The Belarussian part is the smallest,18 km long out of a total length of 101 km. Three locks are on this part, two of them easy to reach : the Dambrowka and the Niamnova lock, both constructed in 1829. They have remained in their original form with wooden locks and a drawbridge. The Nemnava is the last on the canal, with 3 chambers. From there, the canal flows into the river Bieman.